An extensible account recovery tool. 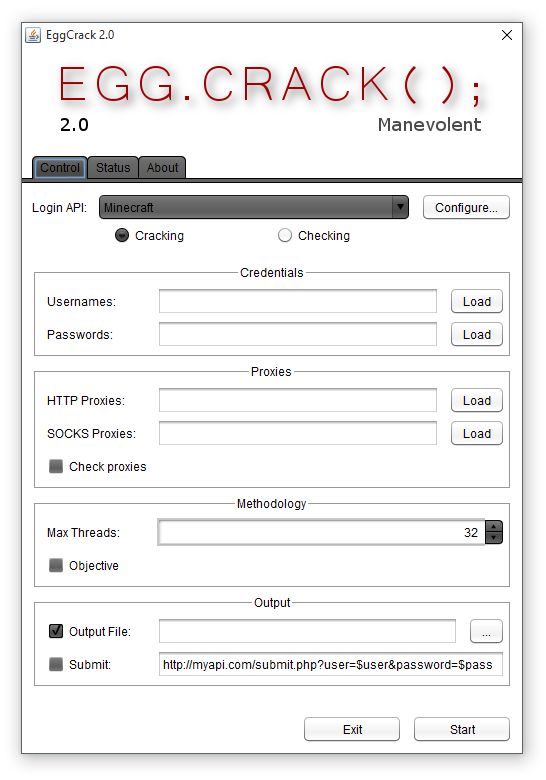 EggCrack is a well-known Minecraft account recovery tool. Popular for its intuitive interface and responsive design, EggCrack has recieved much praise over its two years of reliable yields and non-proprietary stance. Re-written and now open-source, the tool's sourcecode is available to you and potential contributors. EggCrack originally gained its popularity on Nodus Forums back in 2013, when the original Java program was posted and garnered much attention. From there, a thread was made on MPGH (http://mpgh.net/), which still holds much attention and remains the most popular thread in its section. If you are an end-user running EggCrack, everything you need is in the release folder. If an update is available, the program will automatically alert you. To verify the downloads, see the corrosponding .sig files in the release directory. The GPG ASC key has also been provided. We welcome any issues to be submitted through the repository's issue tracker. Keep in mind that any bugs or suggestions reported outside this system are likely to be ignored. If you have discovered a vulnerability in our code, malicious intent of the software, or other security issues, please contact us directly instead of publicly posting an issue to avoid spreading it. If you would like to contribute to the development of EggCrack, fork the repository. Once you have made the changes you desire, create a pull request. This will be reviewed by project maintainers, and potentially be accepted into the repository. Should you be interested in maintaining the project as a team member, contact me using any of the available contact methods supplied and state your request.